This publication is to show you How to Start an Event Planning Service in Nigeria as an entrepreneur. Becoming a Standard Event Planner & Manager in any part of the country including Abuja, Lagos, Portharcourt et el. Event Planner is the creative and pre-event process so it requires skills and research. First of all, who is an event planner? According to www.quora.com, an event planner is the person who managers all the activities prior to the actual event. event manager actually manages the event; this is the more practical and same day side of event design. What is the difference between an event manager and event coordinator? What skills are required for event management? What do special events managers do? What is an event planner called? Becoming a Standard Event Planner & Manager in Abuja, Lagos, Portharcourt Nigeria has bee made easy in this article for those people who wants to go into business since there is scarcely jobs i the country due to has economy. Starting an Event Planning Service as an Entrepreneur is simply Putting your party experience to good use by planning, designing etc. As an entrepreneur, it is very important that you learn how to Become a Certified and Successful Event manager in Nigeria because opportunities can come your way in this part of the world. o knowledge is lot, so it will be nice if you add this ideas to your personal archives. To tell you the truth, for you to become a certified and successful event manager in Nigeria, you have to know some things and people too. Research has recently shown that Nigeria spends about five hundred billion Naira every year organizing events ranging from personal and government events. Yes, I just said NGN500 billion, so don't be so shocked as this is an eye opener as to the lucrative nature of the event management market share. Therefore, the event planning and management market in Nigeria is a opportunity for the future as the event market is still growing, rapidly. It is imperative to state that a big future awaits those who are ready to go into this market. Due to this fact, we found it worthy to give trustworthy directions and mind-blowing information to those who would want to make a living in this market in other to make them successful. For you to become a certified and successful event manager the following are your duties for you to get paid for a job well done. You have to obtain information on what your client’s needs and expectations are. You have to conduct necessary research to find out the best ways to meet up with these expectations. You will have to come up with brilliant theme and design for the event. Site Recommendation or selecting a good location for the event. Carefully set timelines and schedules for all activities. You have to make arrangements with vendors for all services like food, music, decoration, drinks etc. You have to make arrangements for transportation and accommodation for people who would be attending the event. You should be able to co-coordinate all vendors and staff that would be involved in the event. You must ensure excellent event execution. Supervising skills is very important in an event planning and then conducting necessary evaluations and making adjustments after the event. Although the duties you would be expected to perform depend on the type of event planning business you decide to open, those are the basic duties for every event planner. Why do People Need Event Planners? To become a certified and successful event manager, you also need to why people require events planners. Events require lots of movements, thinking and talking. It comes with lots of physical, psychological, and mental stress that most people lack the capacity to handle. So, it is more rational and economical in all perspective to transfer these stress to event managers who deliver the goodies on that day. Also, the event managers have some professional touches they give to events which a lay in the field lacks. More interestingly, event planners can help to cut costs and manage resources better so that organizing an event doesn’t have to cost a fortune. Who Can Start an Event Planning Business? Anyone can become a certified and successful event manager! Of course, anyone! Anyone that has the basic skills and is ready to sacrifice time can.Anyone who has a passion for planning, who is attentive to details, has strong co-ordination and management skills and can work well under pressure is perfectly suited for this market. If you have these skills and enough time to spare, trust me, you are in for a kill in the event management market. Then it’s simply time for you to rise, take off your pallet, and walk. I mean, go for it! The world is your oyster. The event management market is not a regulated market where you need certifications to enter. You can be a successful event manager without certifications of any sort, if your skills stand you out. However, people sometimes depend on your profile to be convinced that you are good in what you do. Certifications help you to improve your profile and attract clients who do not know you in person. People would be more willing to work with you if they see you as an experienced professional. To become a certified and successful event manager, obtaining a management degree or a degree in event management would do. Then with some years of experience, you can register to become a Certified Meeting Planner (CMP) or a Certified Special Events Professional (CSEP). To become a certified and successful event manager, You can either be in the corporate event market or the social event market. It’s better to be in either of these markets if you may not be able to manage both of them at same time. The both markets have their different demands and you should choose the one you are best suited to navigate. However, there are no fixed rules as to how many markets to be in at a time. Some people work in both the social and corporate events markets and still do very Well, it depends so much on planning and individual abilities. Corporate event planning, just as the name suggests involves planning events like meetings, seminars, workshops, product launching and branding and similar other events on behalf of corporate organizations while social event planning involves organizing birthdays, weddings, anniversaries and other social events for your clients. 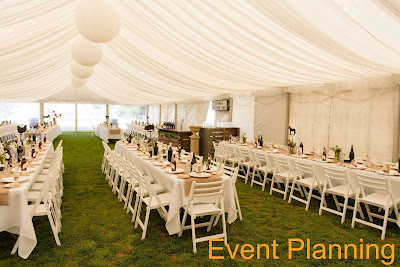 What Resources Do You Need to Setup an Event Planning Business? The resources you need to become a certified and successful event manager are as important. The First thing you need to do is to get your business registered by the concerned bodies thereby obtaining all the required licenses, permits, and fees. Secondly, you need both physical and electronic means of contact. You need to have your office both physically and on the internet. To obtain a physical office, you can either work from home or rent an office space. However, renting an office space lends more professional credence to your business while working from home cuts costs for you, the choice is yours. Then you would need to rent an office space although you may choose to work from home in order to cut costs. Next you would need to spend on advertising, purchase of equipment, employees, and miscellaneous items. Roughly, amount needed to start an event planning business can be anywhere between NGN500,000 and NGN5,000,000. To become a certified and successful event manager, you need practical experiences to further develop your skills before launching into the market. Hence, you should consider working with an established event planner. It’s very necessary for you to create a brand for yourself in the market through works you have done. This would help convince your clients that you are worth hiring. Your portfolio could contain a list as well as photographic and video evidences of all the jobs you have handled successfully in the past. Please understand that portfolio takes time to build and you need not hurry about it. You can also build your portfolio by offering some free services to your friends and family. To become a certified and successful event manager, you must have standby and suitable suppliers and vendors ready to work with you at any time. For instance, you would need good caterers, decorators, florists, photo and videographers, Master of Ceremonies, DJ’s to mention but a few working with you as a team. Be informed, that your potential clients would be interested in your vendors list, so, you should ensure that you have the best service providers on your team. After taking care of the above, you have to determine how you want to get paid for your services. It can be as a flat fee, an hourly rate, a percentage of the event budget or a commission. However, what matters most is that price that compensates you adequately for your efforts and also covers all the expenses you would undertake, so go for that. To become a certified and successful event manager, you need to be versed in the art of networking to be able to promote your event management business. The act of Networking helps you to meet more people and gain new customers. One other effective way to promote your event planning business is through the referrals system. You can liaise with the vendors and service providers and offer them a kind of bonus or commission for referrals. This would encourage them to drive customers to your business so that they can earn rewards. Don’t forget to create a website and also, advertise your business. Have a strong team spirit. Minimize costs to maximize profit. Work to fulfill your client’s vision and meet up with their expectations. However, despite the lucrative nature of the event management market, it’s not all that are cut out for this market. It would be imperative to point out that it would be foolhardy for anyone who lacks the requisite soft skills to venture into the market. For anybody who wishes to be part of this market, it’s important to do a self-skill search before doing that to avoid some futile adventure. Though some people are naturally cut out for the event planning market, everybody still needs some brushing up on necessary soft skills to be a success in the market. On that note, it is advised for such person to go for a refresher course or training. Some of the relevant skills to be acquired as an event planner, if you wish to get to the next level are highlighted below. Event planning is all about organizing successful events for your clients, so organizing skill is needed to become a certified and successful event manager. Organizing skill is topmost in the array of skills required to be a success in this market. So you need to avail yourself of this skill through training. Second in this list of skills is good communication skill. Good communication skill is needed in all aspect of life if you intend to make a success out of your life or career. Its takes good communication skill to understand what your client wants and also to pass your message across to him. If your communication skill is poor, you will never understand fully what your client wants and you will end up delivering poor services which will definitely affect your reputation. If you cannot communicate effectively to your clients and your staff, you will struggle to achieve your aim or goal. Good Listening skill is another vital skill necessary to become a certified and successful event manager. You should be able to effectively listen to your clients in order to get a clearer picture of their expectations. If you don’t have effective listening skills, you are likely going to land yourself in trouble with some clients because you might end up doing what they didn’t ask you to do. In most event projects, especially corporate events, you are expected to work with a mix team comprising of your staff and those of the corporate organization you are working for, working together to achieve a common goal. An event can be ruined by the simplest of details ignored. This can create some dent on the image of the manager involved. So, the ability to pay attention to details can prove to be the breaking point where that huge reputation is lost and won for event managers. The success of an event could mean being able to dot all the ‘I’ and all the ‘T’ and it is your attention to details that will help you achieve this. In case you don’t have it, then you need to develop your capacity to pay attention to details; it will take you far as an event manager. Good knowledge of computer appreciation packages is the basic for every entrepreneur today. Event managers are not left out here. So, you need good computer skills if you intend to make a successful career as an event manager. The entrepreneur is a profit maximize and cost minimize. To maximize profit and minimize cost, you need to be able to bargain adequately on the two fronts of clients and staff. This is to ensure that your clients don’t underpay you and you don’t overpay your staff at same time. As I pointed out earlier, you need to master the act of networking to enable you meet people and get them to hire you. To be a good net-worker, you need good marketing skill to be able to convince potential clients that you know your onus. So ensure that you equip yourself with marketing skills if you intend to do pretty well as an event manager. If you don’t have this skill, you can attend some marketing training and you will surely acquire it. You can get a full List of Event Management, Event Planners in Nigeria from www.vconnect.com. You can even Hire Event planners in Nigeria, get access to Event planning companies for Event Management service in Nigeria online. Feel free to search for Event planners near you using google map. Updates on Becoming a Standard Event Planner & Manager in Abuja, Lagos, Portharcourt Nigeria is available in the search section of this blog.